England fans are leaving work early this afternoon as World Cup fever grips the nation with millions heading to the pub for the opening game. 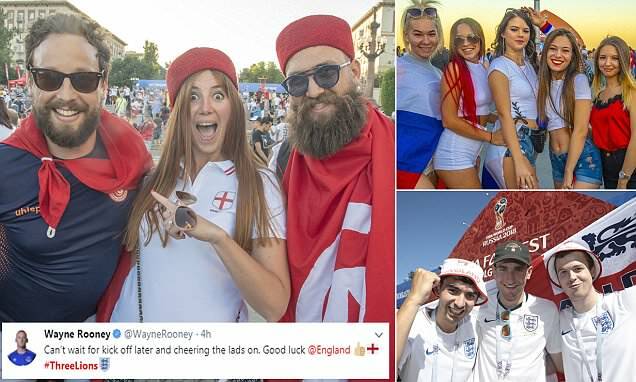 Rush hour chaos is expected to begin earlier than usual as supporters race home or out to their local to watch the clash with Tunisia that kicks off at 7pm. Experts predicted pubs and other venues will be packed out as fans enjoy the sunshine and cheer on the Three Lions tonight. They estimate Britons will drink 14million extra pints, with the British Beer and Pub Association estimating it will bring a £42million boost to the economy. Only 2,500 fans have travelled to the Russian city of Volgograd for tonight's Group G clash. And for those that stayed at home they prepared to down tools early to get a good viewing spot. 'One Fan said on Twitter: 'Work done. Got my beers for this evening. Can't believe I think we are gunna win the World Cup, Football's coming home. And Adammearns wrote: 'Cracking some beers and getting ready for the rollercoaster ride. Lads are young but prepared and ready. All we ask is somethng to be proud of #England. Nerves were also building among Three Lion's fanatics as they prepare for England's opening game, four years after they were knocked out in the group stages in Brazil. One said: 'Nerves kicking in here, come on England! !